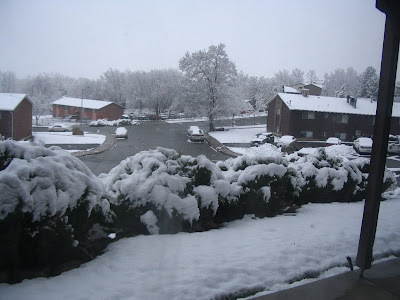 Sheff and Jelley's Blog: Old man winter is still hanging around! Old man winter is still hanging around! Well as Jeff put it old man winter wasn't finished yet. I was finished though! We had a nice relaxing weekend. On Friday we attended an award banquet for Jeff's work where we enjoyed a very delicious 3 course meal. We then sneaked out and went to the BYU iOscars and caught the last of the movies that students had made. On Saturday we hung out at home for most of the day and planned my graduation celebration trip to Miami, Florida/Bahamas. We can't wait to be there, especially after this recent, uninviting snowfall. We then rounded off the night with a movie, The Great Debaters; which we highly recommend! No way - That is so great that you guys are going to Florida! Shelley you totally deserve a nice long break after all your hard work in school! When are you going? Can't wait to see you in May! Congratulations on your determination and hard work, Shelley (and Jeff for support and more)! Darrell and I visited the Bahamas with a business group when Jeff was little. It will be an adventure. Keep us posted.